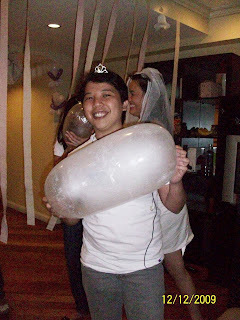 Last December 12, I was invited to attend the bridal shower party of my friend and former colleague Aisah. It was a relief on my part to know that the location of the party is in Fraser Place in Makati. I don't have to worry coming home late since it's near our apartment. We helped with the decorations of the living room area of the hotel room which is a 3-bedroom suite. 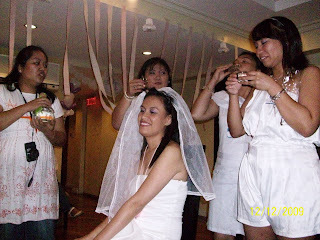 The bride's cousins are present who organized the shower party for her. As the clock ticks by, guests came one by one. Before officially starting the program, we had first a dinner (snacks) so we can have all the energy to participate in the games. 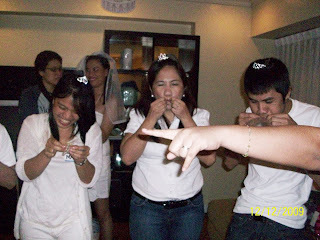 As soon as the party starts we were asked to wear tiaras. 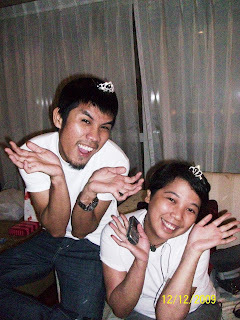 Oieyds and Jem posing a wacky shot with tiaras in their heads. Sorry I don't have a photo of me since I'm the one whose taking the pictures...tsk! 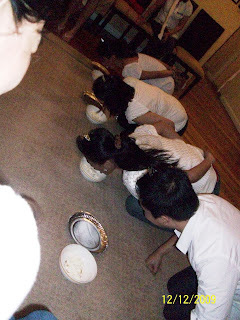 There were 3 games where the guests are required to participate. First Game is you have to get as many breadsticks as you can in a pile of whip cream within 40 seconds. The one who gets most breadsticks will be declared the winner. Second game is to blow an elastic rubber (contraceptive) and make it big as you can. The one who can blow the biggest is the winner. Third game in which I participated is to peel a banana and put the elastic rubber on it. You have to do the task as fast as you can without breaking the banana. The first three to put the rubber on the banana are the winners. Sadly I didn't win as I was gently peeling the banana. 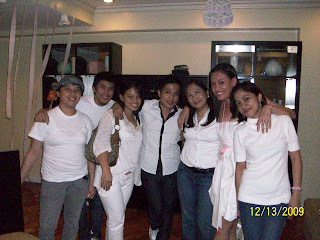 Our group (CAI-STA) together with the bride after the main event...hehehehe.